741 Today, I was led by an Angel to the chasms of hell. It is a place of great torture; how awesomely large and extensive it is! The kinds of tortures I saw: the first torture that constitutes hell is the loss of God; the second is perpetual remorse of conscience; the third is that one‟s condition will never change; (160) the fourth is the fire that will penetrate the soul without destroying it – a terrible suffering, since it is purely spiritual fire, lit by God‟s anger; the fifth torture is continual darkness and a terrible suffocating smell, and despite the darkness, the devils and the souls of the damned see each other and all the evil, both of others and their own; the sixth torture is the constant company of Satan; the seventh torture is horrible despair, hatred of God, vile words, curses and blasphemies. These are the tortures suffered by all the damned together, but that is not the end of the sufferings. There are special tortures destined for particular souls. These are the torments of the senses. Each soul undergoes terrible and indescribable sufferings, related to the manner in which it has sinned. There are caverns and pits of torture where one form of agony differs from another. I would have died at the very sight of these tortures if the omnipotence of God had not supported me. Let the sinner know that he will be tortured throughout all eternity, in those senses which he made use of to sin. (161 ) I am writing this at the command of God, so that no soul may find an excuse by saying there is no hell, or that nobody has ever been there, and so no one can say what it is like. 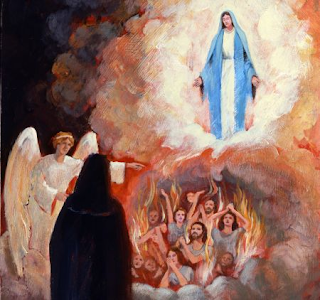 I, Sister Faustina, by the order of God, have visited the abysses of hell so that I might tell souls about it and testify to its existence. I cannot speak about it now; but I have received a command from God to leave it in writing. The devils were full of hatred for me, but they had to obey me at the command of God. What I have written is but a 194 pale shadow of the things I saw. But I noticed one thing: that most of the souls there are those who disbelieved that there is a hell. When I came to, I could hardly recover from the fright. How terribly souls suffer there! Consequently, I pray even more fervently for the conversion of sinners. I incessantly plead God‟s mercy upon them. O my Jesus, I would rather be in agony until the end of the world, amidst the greatest sufferings, than offend You by the least sin. + (162) J.M.J. 742 My daughter, if I demand through you that people revere My mercy, you should be the first to distinguish yourself by this confidence in My mercy. I demand from you deeds of mercy, which are to arise out of love for Me. You are to show mercy to your neighbors always and everywhere. You must not shrink from this or try to excuse or absolve yourself from it. I am giving you three ways of exercising mercy toward your neighbor: the first by deed, the second – by word, the third – by prayer. In these three degrees is contained the fullness of mercy, and it is an unquestionable proof of love for Me. By this means a soul glorifies and pays reverence to My mercy. Yes, the first Sunday after Easter is the Feast of Mercy, but there must also be acts of mercy, and I demand the worship of My mercy through the solemn celebration of the Feast and through the veneration of the image which is painted. By means of this image I shall grant many graces to souls. It is to be a reminded of the demands of My mercy, because even the strongest (163) faith is of no avail without works. O my Jesus, You Yourself must help me in everything, because You see how very little I am, and so I depend solely on Your goodness, O God.